This site has been created by the PVNV (Piddle Valley News & Views) Editorial Team to bring into one place information about the history, activities, facilities and resources - available to residents and visitors alike - in the parishes of Piddlehinton, Piddletrenthide and Alton Pancras, which include the settlements of Plush and White Lackington. Situated in the heart of Dorset and on the upper reaches of the River Piddle, the communities have a population of some 1,220 and lie predominantly along the B3143 and the River Piddle, from its source near Alton Pancras, southward through Piddletrenthide to Piddlehinton. There will be a public meeting in Piddletrenthide Memorial Hall at 7.00pm on Thursday 28th March to discuss the future of the Village Shop. The election of Parish, Town and the new Dorset Council Councillors will take place on the 2nd May 2019. Further details can be foound on the Parish Council website and on the Dorset for You website. An unlit bonfire looks an inviting hibernation spot to a hedgehog. But when the bonfire is lit, the hog will not run out and will suffer a horrible death. To avoid this, build your bonfire on the day you plan to light it. Dark roads: Hedgehogs are more difficult to see during these dark nights, so please slow down and watch out for them when driving at night. For a detailed list (with links) of each change to the news, content and items available on this website, click on the "latest news" button to the bottom right. It is perhaps a good place to add to your "Favourites" list if you are familiar with the site. Index of miscellaneous news items is below. Click on the link to go directly to the article, otherwise, where a page for a specific topic exists, relevant items will generally be on that dedicated page. WITHDRAWL of the Replacement for the 307 Bus service to Dorchester/"Ring & Ride"
The County Council have just advised that due to lack of demand and this service failing to break-even financially, it will be withdrawn as of 1st March 2019. The only bus service currently available will be the NORDCAT service, which has to be pre-booked. Further details of this can be found on Dorset for You website, via this link. 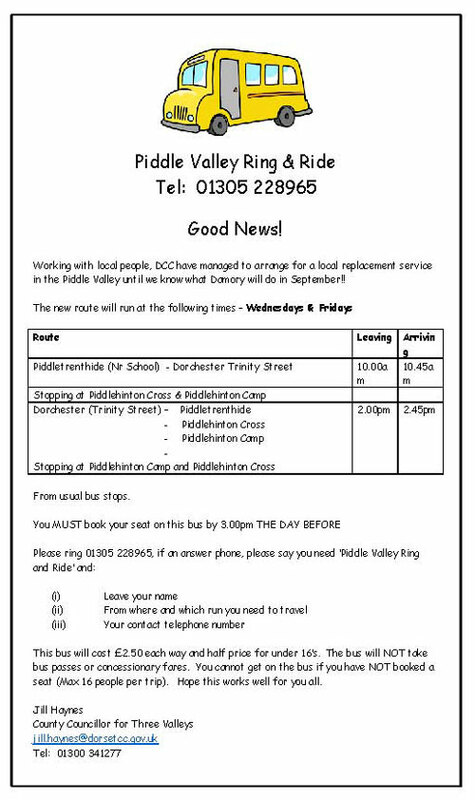 The Piddle Valley Parish Council have set up a working group to research options available to us to maintain a public bus service in the Piddle Valley. At the request of residents from Whitemans Orchard a meeting was held on the 15th December 2017 with our County Councillor, Jill Haynes. NORDCAT, Magna Housing, Piddle Valley Parish Council, and Tim Christian(community bus-Blandford) attended. As a result of this meeting the Working Group sent out leaflets to all households in the Piddle Valley in the first week of January. 700 leaflets were distributed. It was included in your copy of the News and Views. The leaflet asked what requirements you had for a bus service in the Piddle Valley. Sadly, only 6 replies have been received. The leaflet also included details of NORDCAT who are willing to provide a bus service to Dorchester and Sturminster Newton. NORDCAT also accept free Bus Passes. Again, sadly, as we understand it, so far, they have only received one request for a bus Service. Please, if you need a bus to get to Dorchester, you must return the form to a member of the Parish Council. Unless there is an identified need for a bus, we cannot take this project forward. The Dorset County Council subsidised Wednesday bus also needs to be supported if it is to continue. The Rotary Marathon Small Grants Scheme (RoMaGS) will be open for applications until 1st February 2019. All applicants will be notified by 16th March 2019. Income derived from 2018 Rotary Dorchester Marathon is being used to provide grants to local organisations with a view to encouraging, supporting and promoting them and their projects in and for the local community. The 2018 Marathon and this scheme are administered by the Dorchester Casterbridge Rotary Club. Further details area available here. A stalwart group set off round the village to sing carols in aid of The Bus Shelter Dorset, a charity which has converted a double decker bus into a mobile shelter for rough sleepers. They then work alongside other agencies to encourage their guests to move into suitable accommodation and help them integrate back into society. A grand total of £205 was collected so thank you to everyone, singers and supporters alike. Healthy Homes - Warming up Dorset! Do you struggle to keep your home warm or worry how you will afford your energy bills this winter? Contact Healthy Homes Dorset for free, impartial advice about keeping your home warm, using your heating system, understanding your energy bills and making energy saving improvements - if you’re eligible for loft or cavity wall insulation it will be free! We will also register you for power cut support, a handy service to be on if you experience a power cut in your area. Our advice can be given through home visits as well as over the phone. Fire safety alarm and appliance checks can also be organised in partnership with Fire and Rescue for eligible residents. Healthy Homes Dorset is a service provided by Dorset County Council, funded by Public Health Dorset and managed by the Centre for Sustainable Energy in partnership with Evolve Home Energy Solutions. The Post Office service will be reinstated in the village shop at Piddletrenthide as a temporary Hosted Outreach service from 13.30-15.30pm every Monday from 3rd September 2108. If you are concerned that a dog is suffering abuse from its owner, please contact the RSPCA via the following link: https://www.rspca.org.uk/utilities/contactus/reportcruelty. If you see a dog shut in a hot car: - If you have an immediate concern for the welfare of a dog shut in a car, for example the dog is not conscious or you know that it has been in the vehicle for a long period of time please call the RSPCA on 0300 123 0244/0288. You can also contact Dorset Police on 999 if the RSPCA are unlikely to make it to the scene in a sufficient amount of time. Can you legally smash a car window to save a dog? Under Sections 18 and 19 of the Animal Welfare Act 2006, the law states that "only a local authority inspector or a constable have a power to enter a 'premises' for the purpose of assisting an animal that is, or is likely to be, suffering." "Any member of the public who breaks into a vehicle to assist a suffering dog would not be protected by the powers under the Animal Welfare Act 2006, and would no doubt be subject of an investigation for an offence of criminal damage." West Dorset District Council have advised that the approved Neighbourhood Plan has been formally adopted by the District Council and will be used in the planning process. The Piddle Valley Parish Council has set up a working group to look at the possibility of a Community Car Scheme in the Piddle Valley. Buckland Newton, Cerne Abbas and Puddletown all have these schemes. The Dorchester Community Car scheme have agreed to extend their area to include the Piddle Valley for appointments at Dorchester Hospital. Contact Joan Hutson Telephone: 01305 269330. NORDCAT have said that they would be willing to administer the scheme for us, so the administration would be taken care of. The key to the success of a community car scheme is car drivers who are available to spare some time to drive people to the doctors or to a hospital appointment. If you put your name forward, do not think that you will have to accept all requests for help you receive. The more people who volunteer, the less times you may be asked to help. The mileage allowance is 50p/mile, and this can be claimed from home address, to the pick-up point, to the doctors/hospital, back to the pick-up point, and back to your home address. This project is in its infancy. However, to know if it is viable, we need drivers. Please contact one of your Parish Councillors with your name, contact details, and address to express an interest, and they can forward your details to the Transport Working Group. Dorset County Council have provided further details about the Dorset Care Records scheme, whereby Medical and Care records are to be held on a central database. Their information leaflet can be viewed here. DCC have now set up a dedicated page on their website www.dorsetforyou.co.uk where members of the public can notify them direct of defects or other maintenance issues relating to Public Highways. There is also a page where one can report issues relating to Rights of Way. 105 is a new free telephone number that people in England, Scotland and Wales can call to report or get information about power cuts in their area. It will put people straight through to their local network operator. The public can also call 105 if they spot damage to electricity power lines and substations that could put themselves, or someone else, in danger. If there is a serious immediate risk, people should call the emergency services too by dialling 999. May 2016 - The problem of dog waste in public areas continues to be of concern, particularly the track behind the Piddle Inn, the bridleway from there down along West Lane and also along the footways and verges of the B3143 through the village of Piddletrenthide. The lane by Kingrove Farm and the Main Street are used by both residents and visitors and are a less than salubrious advert for our villages, as well as being a health risk for children. It does not take any real effort to take a plastic bag with you when exercising your pet, to collect its leavings and then dispose of them in your domestic waste bin. Dorset Waste Partnership advise that this is acceptable. Using a bag is easy - put your hand inside as if it was a glove, gather up the waste, pull the bag "inside out" with your other hand and - hey presto - problem contained!. PLEASE also take it away and put it in a bin. Hanging the bag on a bush or throwing it into the edge actually is worse, as it doesn't degrade and is very unsightly. The Village Shop may be prevailed upon to stock "poop bags", which are small, very cheap and come in a roll, if there is enough demand. The District Council Dog Warden will be asked to patrol the area, as allowing your dog to foul a public area is an offence. There have been more complaints to the Parish Council about the amount of dog waste left on the tracks and paths around the village, particularly the section of West Lane from Rectory Rd to behind West Lodge, and the lane behind the Piddle Inn. Not only are children having to be watched every step to prevent them stepping in the problem, but a number of people appear also to think that it is acceptable to bag up the material but then either just leave the bags on the track edge, or hang them on the hedgerow. This is unacceptable as the bags do not degrade, are unsightly and unhealthy. Please take a few small bags with you when you walk your dog, collect their waste and put it in your rubbish bin at home. I'm sorry to say that, so far, we have never met with the "Poo-Fairy", but her friend the Dog Warden does exist and may have to be asked to patrol the lanes if the problem persists. A poster from the Environment Agency, including website links, regarding revised groundwater flooding arrangements and notifications. SSE have advised that they provide an emergency support service for individuals or areas where there are special needs, in the event of a significant power cut. They can provide additional help if you have particular medical needs at home and are dependent on electricity. Contact numbers are:- freephone 0800 294 3259; mobile 0345 072 1900; textphone 0800 316 5457. If you have need of their services, or know someone else who does, please do not hesitate to contact SSE direct. Dorset CAB offers free, impartial, advice on any problems, including Benefits, Relationships, Housing, Debt, Education and Employment. They have Bureau offices at Dorchester and Sherborne and also offer Outreach sessions at the GP surgeries in Cerne Abbas and Maiden Newton. They can also arrange Home Vists if necessary. The Parish Council is often notified of Public Consultation documents on many topics. A separate page has been set up on this website, in the Parish Council section, where these are listed for your perusal. Help and Care is a local independent charity working on the side of older people and carers in Dorset. We have recently been funded by to hold a number of free workshops across Dorset for people who care for family members and friends who live within the boundaries of Dorset County Council. Attached is a copy of our September timetable and would be grateful if you could help publicise these events to your local parishioners. A further timetable of the workshops dates for the remainder of the year is currently being prepared and will be forwarded to you once it has been completed. If you require any further information regarding the workshops or the services provided by Help and Care please contact myself or a member of the Carers Training team via the below email address or by calling 0300 1113323. Their poster can be viewed here. The superfast fibre continues to roll out. Plush is set to join communities in The Piddle Valley already benefiting from the fibre broadband roll out. Most residents in Alton Pancras, Piddletrenthide and Piddlehinton can get superfast broadband as a result of the Superfast Dorset programme, while residents in White Lackington can upgrade to a slightly faster than standard fibre service. Residents will need to contact providers to upgrade. *Plans may change subject to detailed survey. Superfast Dorset is a complex engineering project and we are not able to provide specific timescale for planned work. Individual speeds and availability will vary. 04/04/2017 - Alton Pancras is now ready to be connected to the fastest broadband fibre service available - "Fibre to the Premises" or "FTTH" - a fibre connection terminating inside your house, rather than at the nearest green kerbside cabinet - which can give speeds of up to 330mbs!. This is via the green clinders which have now appeared on most of the telephone poles in the village. Similar installations are being provided in the Church Lane area of Piddletrenthide. A fibre service is also now being brought to Enterprise Park. Anyone interested in this service must contact their existing broadband supplier to see if they can upgrade. It may be necessary to change supplier to take advantage of the new service. Details of the service can be found at www.dorsetforyou.gov.uk/superfast/fttp. 12/12/2016 -Superfast Broadband is now, largely, available in the Piddle Valley. There are aras where service is restricted or is still to be made available, but these are becoming smaller. You are recommended to contact your preferred broadband supplier and check what service they (and others) may be able to now offer you. Dorset County Council for the Superfast Dorset team have also written to advise that our parishes may have a number of properties that could be eligible for the Better Broadband Subsidy Scheme. The scheme is aimed at those on the poorest broadband speeds who aren't in their plans to get fibre. After eligibility checks, subsidies are offered to individual homes and businesses to go towards the installation costs of a wireless, satellite or 4G internet connection. Local wireless suppliers are using the scheme to extend the coverage of their networks, which means our community could get a service from them even if they aren't operating in our area already. They may consider covering our area if there are a number of eligible properties in the same location. Very rural properties, small hamlets and farms are often the premises that are on the poorest speeds, and would therefore be eligible for a subsidy. Dorset County Council is excited to announce the launch of a traffic and travel portal 'TravelDorset'. TravelDorset brings together all traffic and travel information for the whole of the county including live traffic alerts, road works, diversions, live bus and rail departures and cycling/walking routes. This is a great resource for local residents, businesses and visitors helping them get from A to B whether it's by road, bus, train, bike or on foot. The website address is:www.dorsetforyou.com/traveldorset, and it is also available through the "Local Interest" index link on the left menu. The Dorset Police 'Ringmaster' emailed warnings of current issues - crimes and scams - that may affect the valley are available on the "Dorset Police Ringmaster" pages of this website. Generally, it should be noted that any information about events, or news from the Parish Council , that is too late or too large for inclusion in the printed News & Views, will be published here. There is a link at the top of the Index, to the left, and also a separate button on the top right of the Home Page, to a page which shows the latest articles that have been added. I hope this will help you keep track of changes on your favourite pages. All active links on the Index to the left are in black and will show an arrowhead alongside as you move the mouse pointer over them. When appropriate, there will also be a ++ shown against the particular topic that you are viewing, to aid navigation around the site. If you are a representative of any Club, Society or other Organisation and would like to be included in this site, please contact the Editor on editor@piddlevalley.info or me at webmaster@whitepuppy.co.uk to discuss. The list of headings in the Index to the left is not exclusive and will be extended as necessary to include you.